Two Too Many Twos at Connolly? Sometimes a number catches my attention. The other day I made two photos of Irish Rail 02 22222 arriving at Connolly Station, Dublin. If I hadn’t had my Lumix LX7 with me and ready to go, I might have been too late to make this photo. And that would have been too bad. Irish Rail 02 22222 at platform 5, Dublin’s Connolly Station. Lumix LX7 photo. Irish Rail ICR’s with a pastel sky at Kildare. Irish Rail Intercity Railcars work downroad (away from Dublin) at Kildare. To make the most of this scene I needed to make some global (overall) and localized contrast adjustments in Lightroom. This was necessary to compensate for the contrast characteristics inherent to the digital file produced by my FujiFilm X-T1. I worked with the RAW file which has substantially more data than the in-camera JPG (which is compressed and thus offers very little information above what is immediately visible to the eye). Irish Rail Passenger Trains; Grab Shot in the Gullet, Dublin. The other day I was at the St. John’s Road roundabout. A Mark4 set was blocked as an in-bound ICR (intercity railcar) bound for Dublin’s Heuston Station over took it on the middle road. The Gullet is the three track section in a cutting on approach to Islandbridge Junction in Dublin. Using my Lumix LX-7, I made this photo by holding the camera over the wall and gauging composition from the live-view digital display at the back of the camera. I lightened the shadows in post-processing to improve contrast. For the next couple of weeks Tracking the Light will be on auto-pilot while Brian is on the road. Posts should appear daily having been pre-programmed into the holding queue. New Posts Every Day (hopefully). Irish Rail InterCity Railcars Bask in the Evening Sun at Heuston Station. Last Tuesday, I noticed a shaft of sunlight that had illuminated a pair of trains under the shed at Dublin’s Heuston Station. Irish Rail Trip to Co. Mayo—Daily Post. Traveling Across Ireland by Train. Heuston Station departure board shows the 0735 Galway train with connections to Mayo. I was heading to Foxford, one of the smallest stations on the route. I used a slow shutter speed to capture the LED sign. My exposure was f2.5 at 1/40th of a second. LEDs are not a constant light source and flicker on and off many times a second. While this isn’t perceptible to the naked eye, when photographed at higher shutter speeds the lights may be caught instead of on, which makes it hard to read the signs. On March 13, 2014, I bought a day-return from Dublin Heuston to Foxford, Co. Mayo, and traveled on the 7:35 am Galway train. My train was well patronized, but I had no difficulty finding a seat. Rotem-built 22000 series Intercity Rail Cars are Irish Rail’s standard passenger consist for most services. On March 13, 2014, ICRs destined for Waterford and Galway were side by side on the platforms at Heuston Station. Lumix LX3 photo. Another view of Rotem ICRs at Heuston. My train is the closest to the camera. Exposed with a Lumix LX3. It was foggy in Dublin. Ensconced in my seat, I observed that my train departed Heuston precisely on time and soon was rolling down-road at track speed. My train was a four-piece Rotem-built Intercity Rail Car, of the type that is now standard for most Irish Rail Intercity services. Except for some rough spots west of Kildare, the ride quality was comfortable and smooth. Interior of the Rotem ICR at Heuston Station. Exposed with my Lumix LX3. 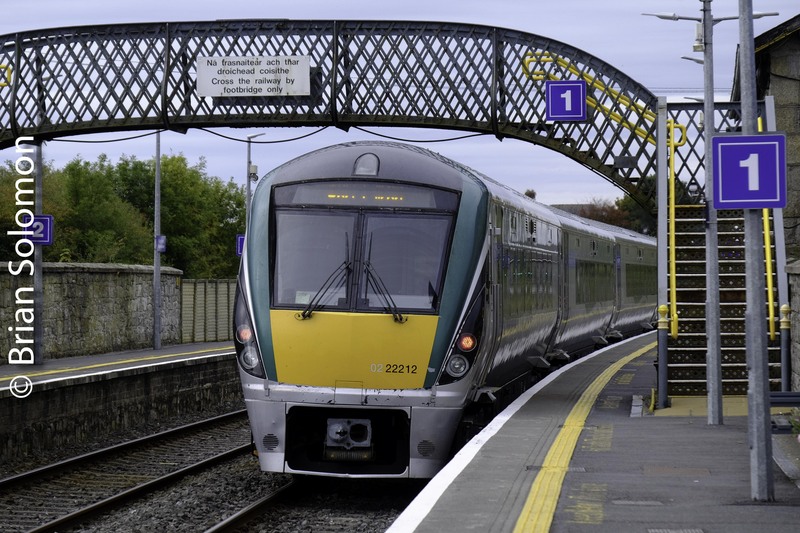 At Portarlington, we diverged from the Dublin-Cork mainline and traveled on the single track branch toward Athlone. At Clara we crossed (met) an uproad train. I changed trains at Athone. Here another four piece ICR was waiting to continue the journey toward Co. Mayo. At Castlerea we met the Ballina-Dublin IWT liner, a train I’ve often photographed. It was as foggy in Athlone as it had been in Dublin. I changed to the ICR on the left. This was destined to Westport. Notice the LED display boards are impossible to read in the photo. This is an affectation of using a faster shutter speed. A few of the LEDs are on, but many are off. Lumix LX3 photo exposed at f2.1 1/500th. Since the trains are stationary, I probably should have manually set the shutter speed to about 1/30th to better capture the destination boards. Upon reaching Manulla Junction, I again changed trains, this time for the 2800-series railcar that works the Ballina Branch. Years ago this would have been a single General Motors class 141/181 Bo-Bo diesel electric with a short Craven set. When I arrived in Foxford I was met by my friend Noel Enright. We spent the rest of daylight photographing trains and visiting friends. I’ll post those adventures soon! Stay tuned. Interior view of the 2800-series railcar I traveled on between Manulla Junction and Foxford. Lumix LX3 photo. Foxford, County Mayo. This 2800 will terminate at Ballina, several miles to the north. Lumix LX3. Noel Enright poses with the driver of my train. Irish Rail’s Tony Cooke and Amtrak’s Douglas Kydd at Heuston Station with Intercity Rail Car 22311. Lumix LX-3 photo. Click here for views of Irish Rail 077 in the new livery! Located near the Guinness Brewery along the south bank of the River Liffey, Dublin’s Heuston Station is a classic example of a railway terminal from the dawn of the railway age. Despite its age it still serves as one of the city’s primary railway stations and is among the oldest railway stations in continuous use in the world. Few stations have survived from the formative age of railways, and far fewer city terminals exist from this period. On April 9, 2013, I facilitated a short tour of Heuston for visiting Amtrak locomotive engineer Douglas Kydd who was on vacation in Ireland with his Fiancée. Among the highlights was the opportunity to inspect one Irish Rail’s newest trains. Irish Rail 22311 and other 22K-series Intercity Railcars under the restored 1840s-era Heuston Station train shed. Lumix LX-3 photo. 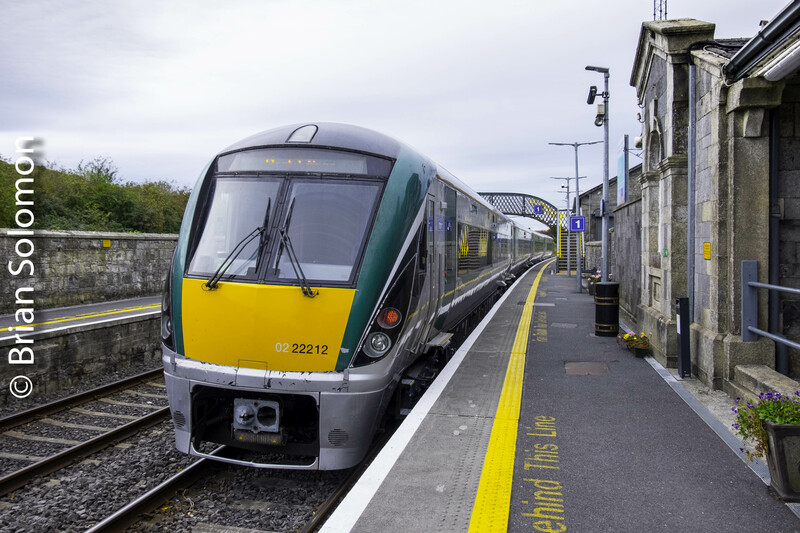 Irish Rail 22311 arrived in Ireland on August 17, 2012 and officially entered traffic on on December 20th last year. It retains the gloss and an aroma of a new car. Lumix LX-3 photo.